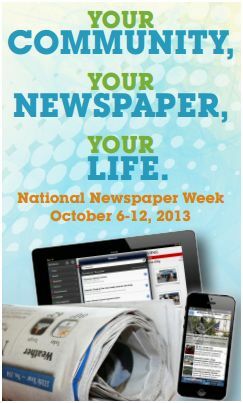 National Newspaper Week runs today through Saturday. Push past my comfort zone. Early in my career, I wasn’t comfortable with new situations, but as a reporter, I always tried new things. My first month as a reporter covering the police and court beat, I had to stand up in the court room and request that it not be closed to reporters. My knees were knocking, but the court stayed open to the reporters, and I got my story. I also went hot air ballooning, trained with the National Guard and talked to a serial killer for a story – all of which pushed me past my comfort zone. Accept criticism and feedback. News is supposed to be objective but readers always have an opinion. And editors definitely do. Starting out as a writer and getting constant feedback turned me into a better writer, but to get there I had to be willing to accept the feedback. When I wrote a column, I learned quickly that everyone had an opinion, and not all were favorable. Today I have fairly thick skin. Handle multiple assignments. My first job required reporters to turn in a story each day. That meant I always had to be working ahead. I’d aim to develop and write a few evergreen stories to have in my back pocket. I’d attend meetings that would provide that day’s story and a follow-up story. I learned lots about time management and meeting deadlines. Network. The only way to ensure I could have a story each and every day as was required in my first newspaper job was to cultivate lots of sources. Anytime I met someone, I would ask for their contact details and add them to my Rolodex . Each year, I’d have to get a bigger one. Now I just keep all my contacts online. When I needed a story or a quote, I would always know whom to call. Not burn bridges and always be honest. One time I paged a detective (remember pagers?) who wanted to know how I had come to have the number. I told him that I saw it on the chief’s desk and wrote it down in case I would ever need. It was a big case, and I needed a quote. Because I was honest and had had his number for six months, the detective gave me the quote I needed. The newspaper still arrives each day in my driveway. I get lots of my news online and from Facebook posts, but I always enjoy holding the newspaper, maybe because of how much I learned from those early days as a reporter. Thank you for summing up the value of reporting for a newspaper. That also is how I became a non-fiction writer. Absolutely on target–almost the story of MY life. Thanks for the memories.